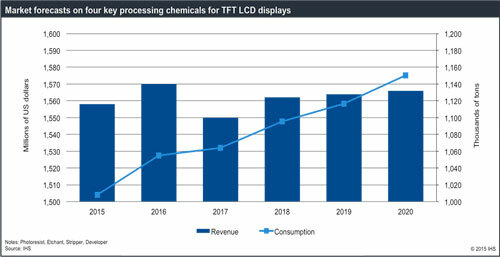 Kihyun Kim, senior analyst of chemical material research for IHS Technology further explains that the TFT LCD manufacturing process consumes more etchant than any other chemical in the electronics industry. With screen resolution increasing, use of this component is on the rise. 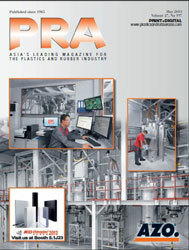 By the end of this year, photoresist, which is also widely used in the display industry’s photo-lithography process, is expected to reach US$270 million; stripper, used to remove photoresist in the photo-lithography process, will exceed $310 million; and developer, used to develop photoresist when exposed to light, will reach US$130 million, according to the latest IHS Display Chemical Materials Report, which examines the top seven chemical materials used to manufacture a TFT LCD panels. It reported that revenue for RGB resist, resin BM, and photo spacer, which are used in colour filtering, will reach US$1.4 billion this year. Furthermore, Kim mentioned that the display chemical materials market will grow continuously, due mainly to Chinese panel makers’ aggressive manufacturing investment plans. 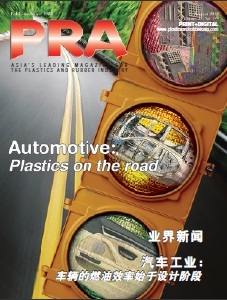 “Larger fabs consume more chemical materials; however, revenue growth for chemical materials could be slower than consumption growth, because of severe price erosion, “ he said.